I’ve always dreamed of having my bedrooms look as Christmassy as the rest of my StoneGable in December. 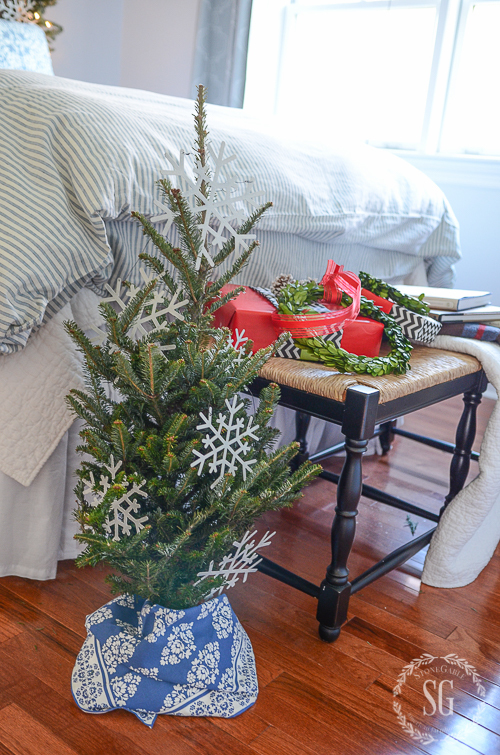 Full of pretty greens, a tree in each room, little white lights and a red comforter! Christmas cheer in every room! Sometimes StoneGable is more like a hotel than a home! And that is especially true at Christmas. Every room at StoneGable will be full this year… and that’s just how I like it! So this season I’m decking my bedrooms out in festive style! I’m thrilled to be a part of the bHome Christmas Tour. If you are not a member of bHome you will certainly want to be! About 50 of your favorite bloggers all together on a wonderful, user friendly app for smart phones! Come join me and join in! This is day 3 on the tour! You won’t want to miss a house. 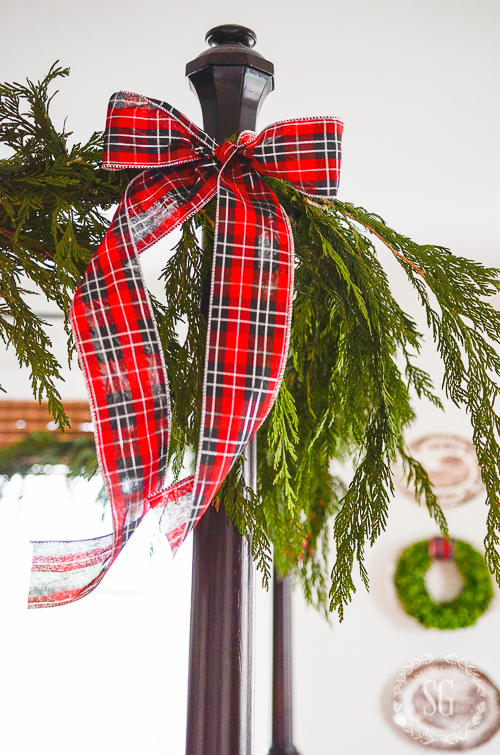 We have a wonderful line up of bloggers and decorated homes! 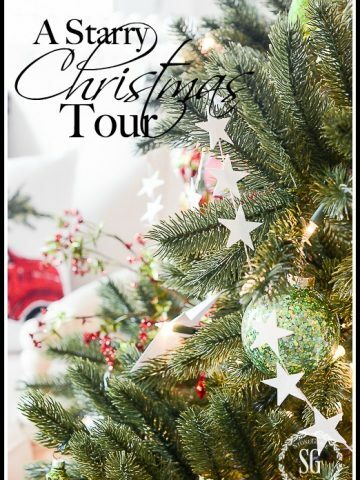 Make sure you check out the other Christmas Tours at the bottom of this page… and enter the GIVEAWAY too! 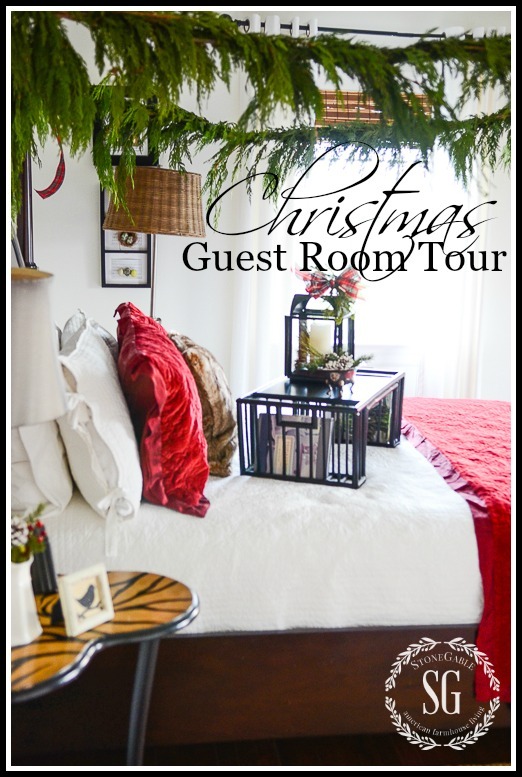 I’m sharing a couple of my guest bedrooms for this tour! The first bedroom is the J&J guest room. It was my daughter’s bedroom and where she and her husband Jonathan stay when they come home. This picture of Jacqueline and Jonathan captures their sweet young love! I like to keep my guest rooms pretty free of clutter. It gives my guest more room to move around. Bobby and I trimmed the bed with a real cedar garland. 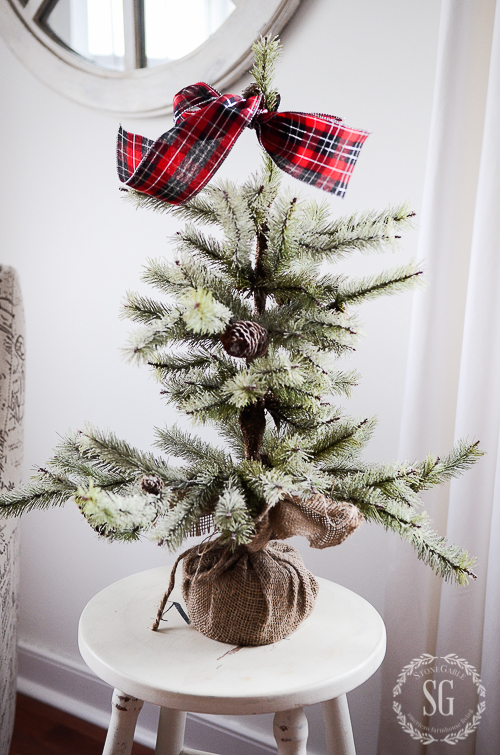 I tied a pretty red plaid bow on each bedpost. Plaid is so trendy this year! If you want tips to keep your live greens fresh longer click HERE. We sprayed the cedar with a antitranspirant so they will last much longer and not drop. You can find out what I used HERE. This year I bought Christmas bedding for this room. I’ve always wanted special bedding for the holidays! I found this pretty red washed velvet on sale (40% off) at my local Pottery Barn Outlet. The quilt and pillow shams have a pretty silk edge. I also got a faux fur pillow for the bed! 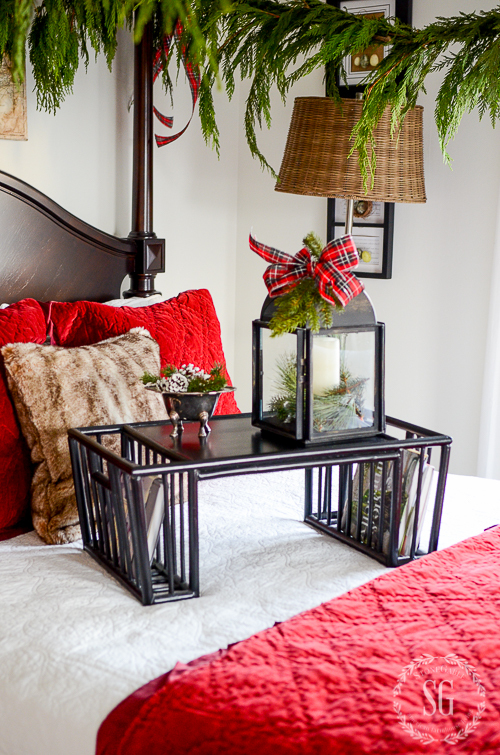 The bed tray is decorated with a lantern and a little footed silver bowl of white pinecones and boxwood. The candle in the lantern is battery operated and is on a timer. In the evening the candle gives off such a pretty glow! 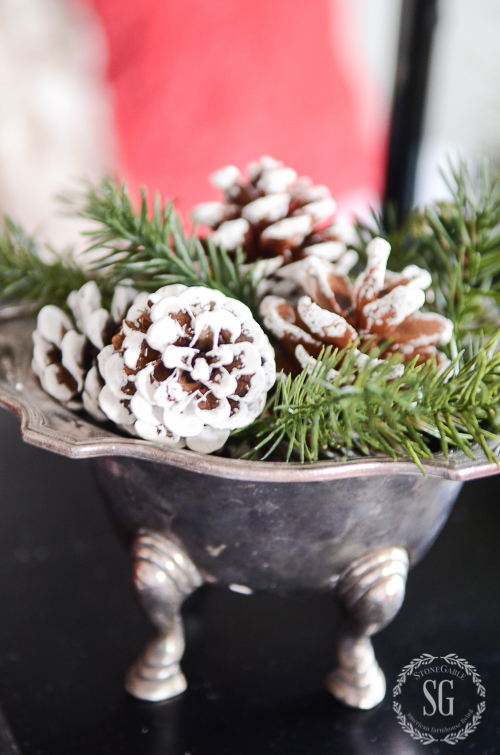 On the animal print side table a small white pitcher is filled with greens, berries and a pinecone. 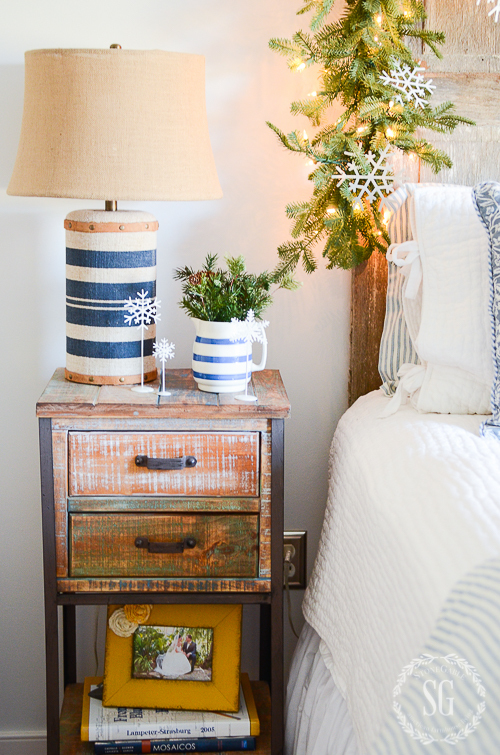 Opposite the bed is a cozy chair and a little Christmas tree on an old stool. 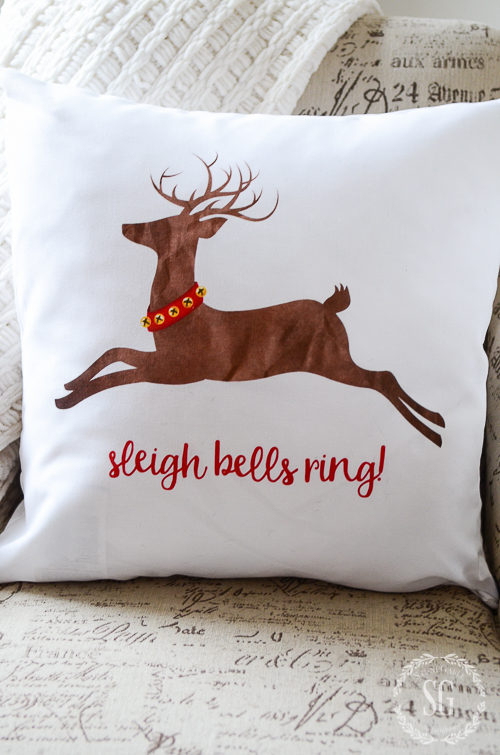 The fun and festive reindeer pillow is from Society 6 and is a creation of my friend Ann, On Sutton Place. Isn’t this a happy pillow? And it’s a nice big one too! Ann is so talented and I love her work! 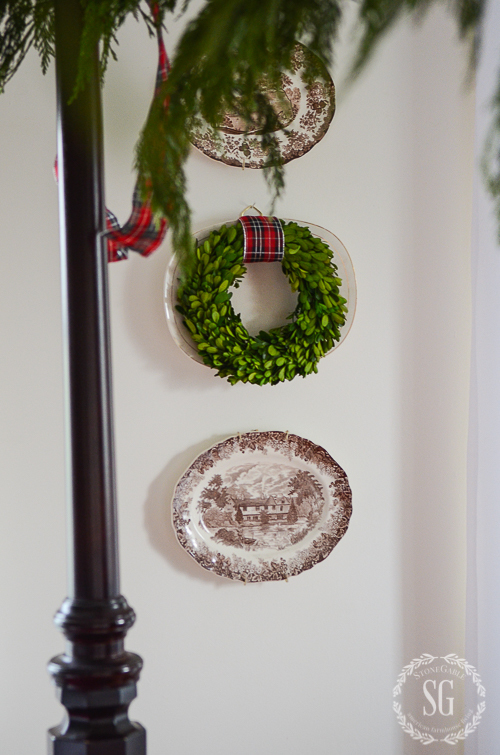 A boxwood wreath hangs on a plate that belonged to my paternal grandmother. It’s the only thing I own from my father’s side of the family. Let’s move to the other guest room on my tour. It was my son Christopher’s room. Now that he’s married he and his wife Abigail are staying there for Christmas! This room has a comfy farmhouse inspired feel. It’s chippy and soft and has pillow ticking bedding. I decorated it with Abby in mind. My husband made the headboard out of big shutters we found at a local shop that carries lots of vintage goodies! 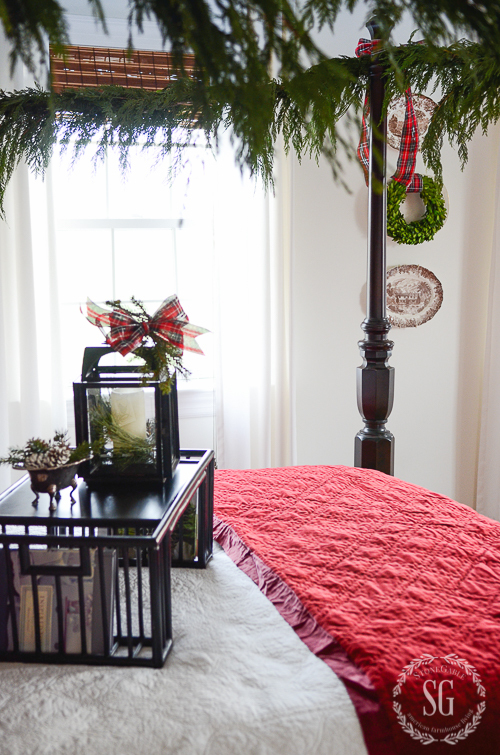 I hung a Balsam Hill lit garland across the headboard. 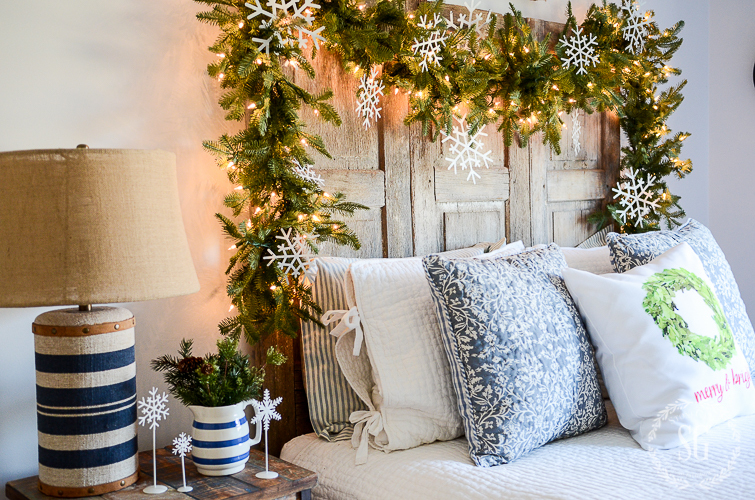 White metal snowflakes fly across the headboard. 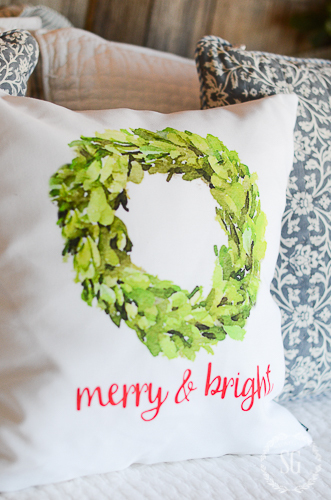 Did you notice the Merry & Bright wreath pillow? It’s another pretty pillow from Ann! LOVE LOVE LOVE them! You can find this one and many others at Society 6. 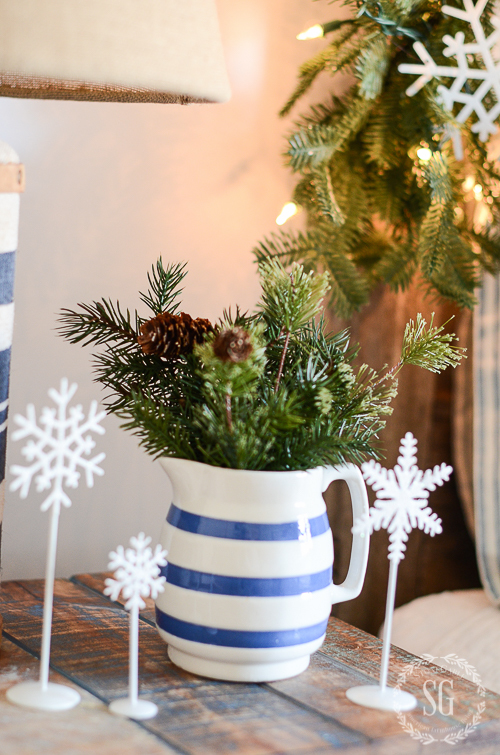 One of my favorite things in this room is the little french blue and white pitcher on the nightstand! I filled it with Christmas greens. There are cozy robes waiting for our guests. 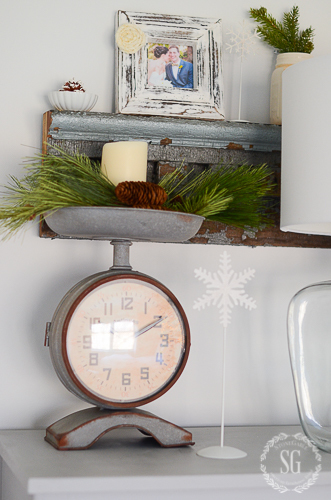 On the dresser is a fun, unique clock! I nestled a batter operated candle in the greens. It looks so pretty in the evening! On the vintage shelf is a picture of Abby and Chris on their wedding day. Sigh! Did you see the tree in this room? It’s a little “tree top”. And the tree skirt is a napkin. 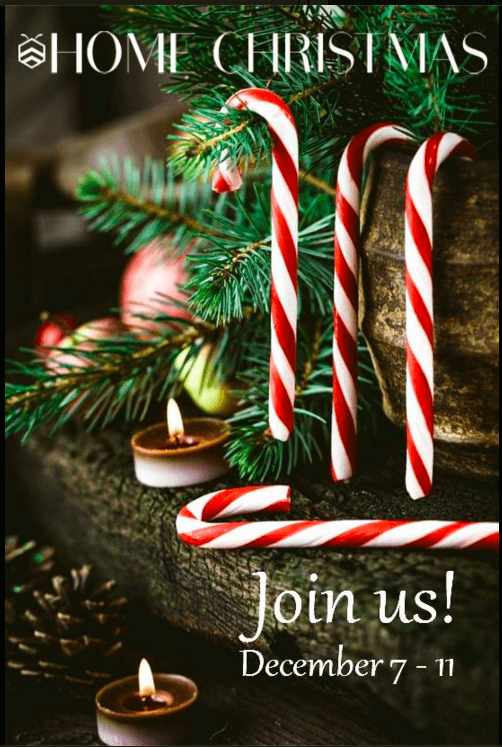 The week of Christmas I’ll be joining some fabulous bloggers and do a candlelight tour of our homes. We will turn down the lights and give you a look at our home at night… with all the lights and candles on! I am sooooo looking forward to sharing this with you! I think my bedrooms are my favorite at night! 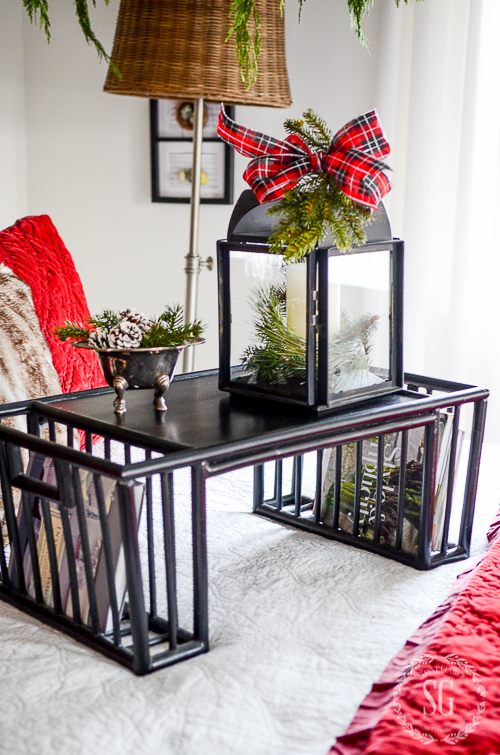 I hope you have like my Christmas Guest Room Tour. 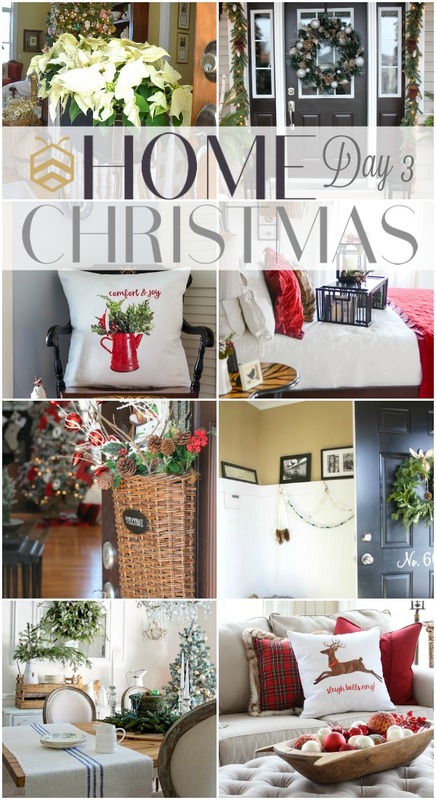 Make sure you stop by the Christmas tours of the other bhome bloggers below! I hope you will ping my star on bHome and make StoneGable one of your favorites! Nothing better than Christmas!! Beautiful ideas and homes! Outstanding is all I can say!! Yvonne you have done a beautiful job on those guest rooms….I sure would love to stay with you this holiday!! Wow!!!! 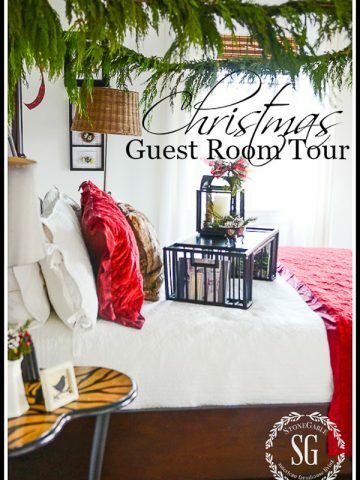 Love your Christmas decorated guest rooms! I would stay in a heart beat!! You have such a nack for decorating and making everything so warm and welcoming. I hope you and your family have a wonderful Christmas! These rooms are like a special Christmas bed and breakfast!!!! How lovely. I’m going back to read how to preserve greens. I realize I did not click the link!! Always useful information along with inspiration while getting to take a wonderful house tour. Thank you. Who wouldn’t like to be a guest in your beautiful home! I can just hear all the exclamations are your “kids” enter these rooms that were so lovingly prepared for them…what an incredible gift you have. Merry Christmas! OMG! I’m loving both of these rooms, Yvonne you’ve done it again. I can visualize my hubby and I lounging in one or both-ha-ha!! I’m dreaming of a visit to Stone Gable (reminds me of the movie, “White Christmas”). Beautiful guest rooms. 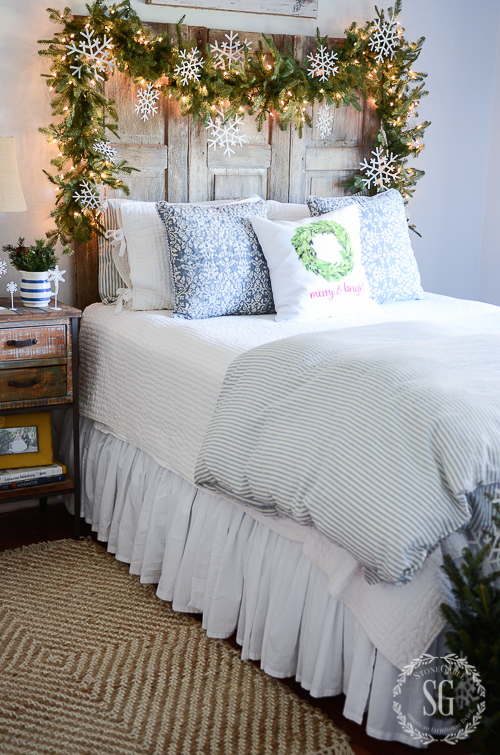 I especially love the garland with the snowflakes over the headboard. Stunning!!! So warm and inviting. Ditto to all the amazing compliments you received. 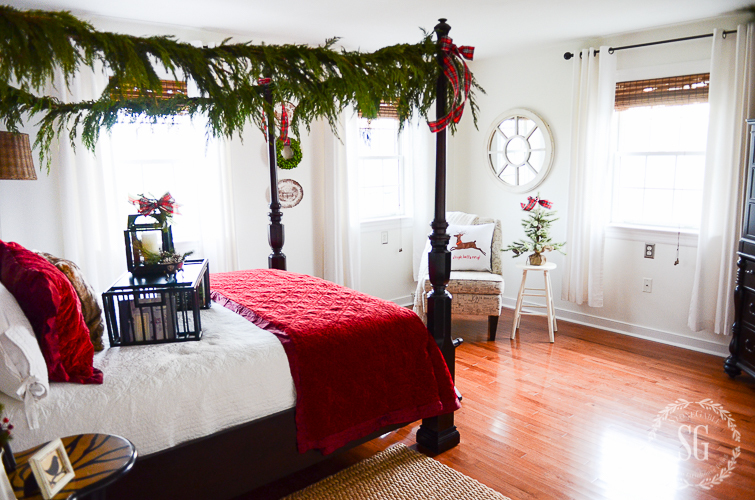 I do so love a bedroom decked out for Christmas, and your guest rooms are just perfection! Your guest rooms are so inviting. Can I come and visit a while? I’ll bring chocolates. Beautiful bedrooms.I love the shutter headboard and the addition of the battery operated candles,I have them all over my house too.Can’t wait to see the candlelight tour. I LOVE a home with only Christmas lights. Love the guest rooms. Do something on really small guest room. Be a faithful reader but now, sometimes, I just skip the whole thing!! Hi Tally, the only ads you should be seeing are at the bottom of the page and on the sidebar. The ones in the body of my blog are not obstructing images. I am so thankful that companies want to sponsor StoneGable. Without them, I could never keep this blog. You cannot imagine how expensive it is to publish a blog. I could never afford to make changes to my decor to keep inspiring the readers I so dearly love unless supported by advertisers. I hope you can look past them, like you would a magazine if you are not interested and enjoy the creativity and information and ideas and tips and inspiration I try to bring you daily. Thanks for understanding! Hugs from StoneGable. Such a beautiful home you have Yvonne. Blessings and love are so evident in all you do! What a beautiful compliment, Clare! Thank you! Love your style and everything about your home! 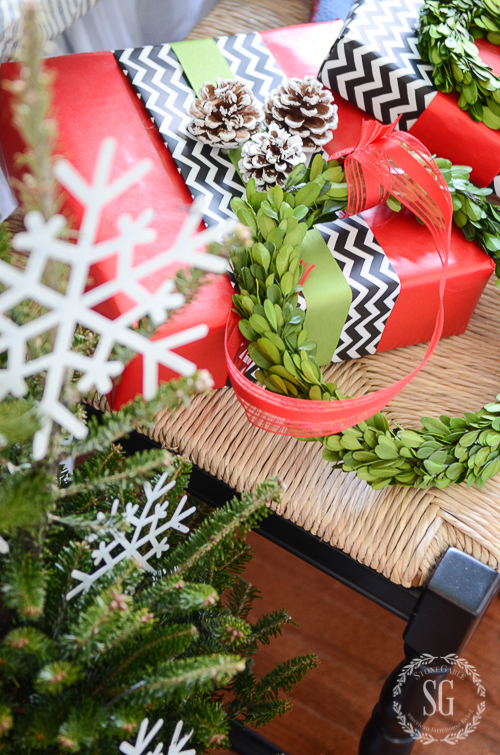 Question: how do you store the MANY seasonal decorations? 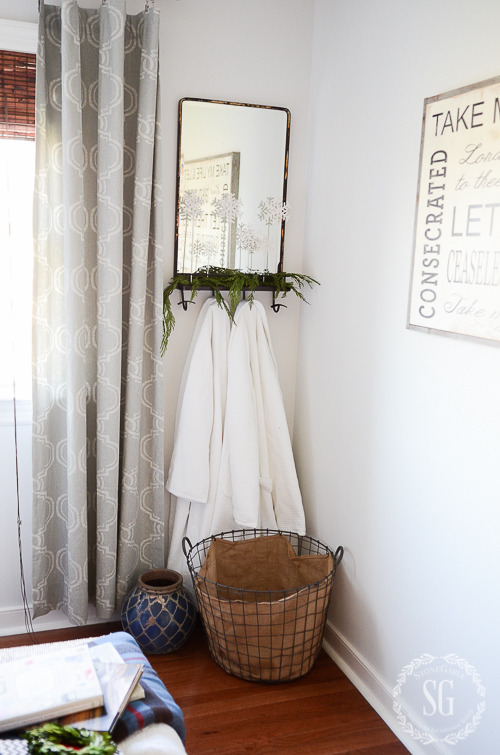 Do you designate a special closet for seasonal bed linens, etc?? Lovely rooms. Very inviting. Is the background on your pillows cream or white? 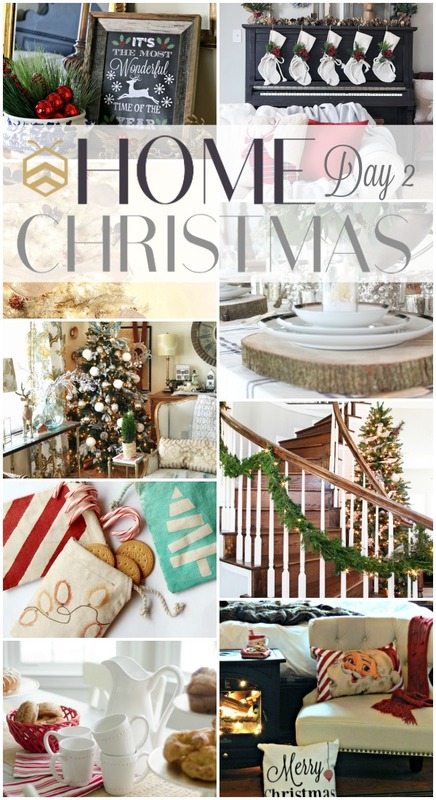 Love your home at Christmastime and all year too! Thank you for much inspiration! I love your bedrooms…so beautiful…..sigh.Your guests are lucky people to be staying there. Thank you for sharing this rooms.? Cam I come and stay overnight??? How gorgeous !!!!! I love all of your decor! I’ve gotten many ideas from your blogs! I, too, am swooning over Christopher’s room. It is absolutely inviting. Can I get in the queue for settling into it’s inviting charm? I want to come stay in the guest bedroom! Love these rooms. I return to this site often. I am going to copy the idea of using the top portion of a tree as a small tree. I really like the way you use natural greens to your rooms. Your use of red is so cheery and bright! The pillows are a sweet touch too. After seeing your beautiful guest rooms, I have now decided to decorate mine this year! I’m not quite sure how to start, Yvonne! Both bedrooms are SO beautiful and welcoming and if I had a guest bedroom, I would also be adding the little “family” touches. 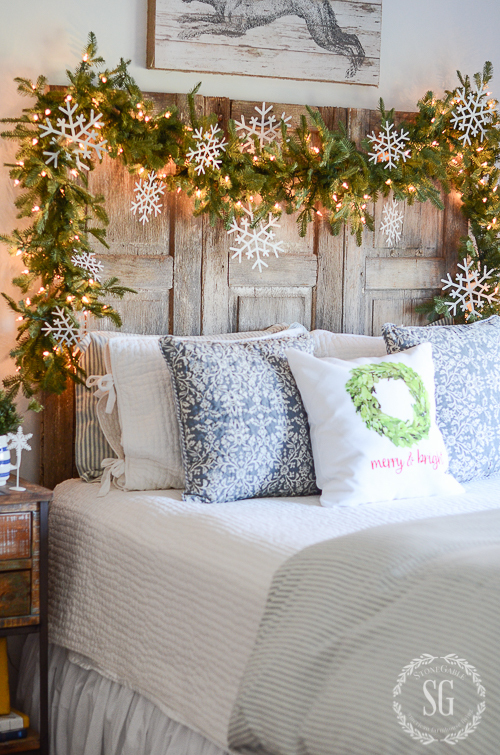 I love your son’s room but sleeping under a sparkling, snowflake garland just above my head (in your daughter’s room) would fill me with joy. I’d feel like a kid again! While your rooms are stunning, I find they are touching my heart this morning and making my eyes well up a bit. They are reminding me of happier times when my husband was alive and we’d be busy preparing our guest room for our son and daughter-in-law. Such special memories! Thank you, Yvonne! Your guest rooms are just gorgeous! I love that they are not too feminine or masculine and really make the whole house feel so warm and inviting. Great job! WOW! The bedrooms are gorgeous!!! The pine for the canopy was a marvelous idea! So calm and beautiful Yvonne – your eye for style never ceases to amaze me! Merry Christmas friend! So many beautiful rooms, if would be wonderful to be a guest in any of these rooms. I will be anxious to see all of the other tours from bHome! Wow, Yvonne! Both rooms are gorgeous! No wonder your kids want to come home for Christmas, who could blame them with those spaces waiting to welcome them. You can tell you put a lot of love into every detail! Merry Christmas!! Yvonne, you capture the essence of the Christmas spirit without over decorating, which is so easy to do this time of year. Its like a fragrance of Christmas. I love everything you do, gives me hope for my future home. I worked for a Bed and Breakfast in Colorado, I decorated each of the beds like you. The guests loved it. Thank you for the inspiration and your Sunday encouragements. God bless you and your family this time of year especially. All decked out for the season, love it! Looks amazing. I love the spare bedroom, it looked so inviting I almost forgot I was looking at it through a screen. Have a lovely holiday season. Yvonne, this is maybe my favorite post of yours! Well, I guess it would be hard to choose a favorite among so many gorgeous vignettes and decorating ideas that you share. I have gotten many good ideas from you and check my email first thing in the morning to see what you have posted. Years ago I purchased some white snowflake ornaments for a wreath I had in my first small house. Sadly, the store has long ago gone out of business and I haven’t seen any like them since. 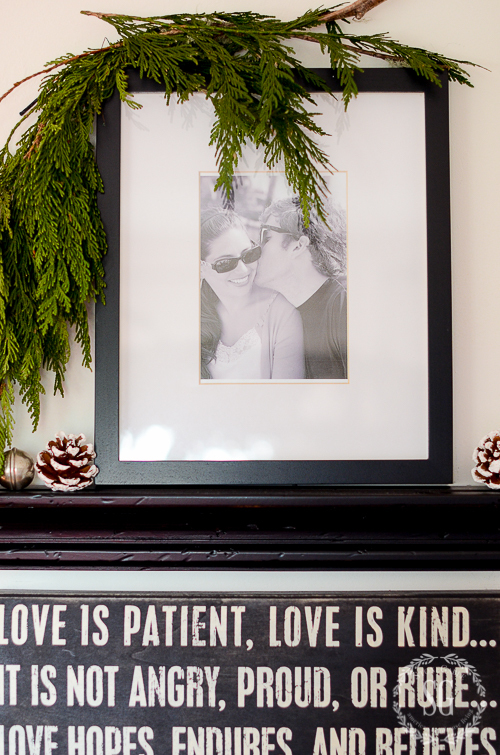 Where would you suggest I look for enough to do a garland on my mantel? We have had sickness in the family and I haven’t been able to decorate for Christmas. 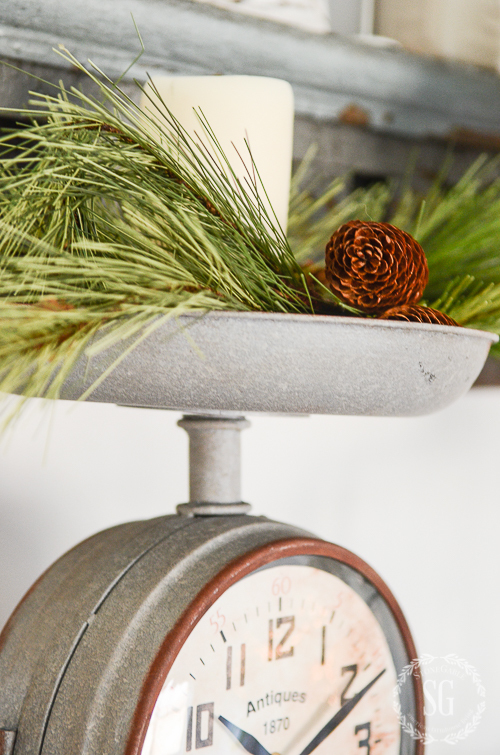 Since we hope to spend Christmas in OH with our babies, I’m going to decorate for winter. I need to find some snowflakes! I hope you have the merriest of Christmases. Enjoy your children who may not want to leave those beautiful bedrooms! MARTHA, I ‘m sorry to hear you are not well. I just prayed for you! It’s wonderful to spend Christmas with family!!! Hope it’s the best Christmas yet! I’m a Balsam Hill girl for greens. They are so realistic! A little bit of an investment, but they are really something special. You can find them online. The little snowflakes came from a local shop call The Old Candle Barn. You can also find them online. 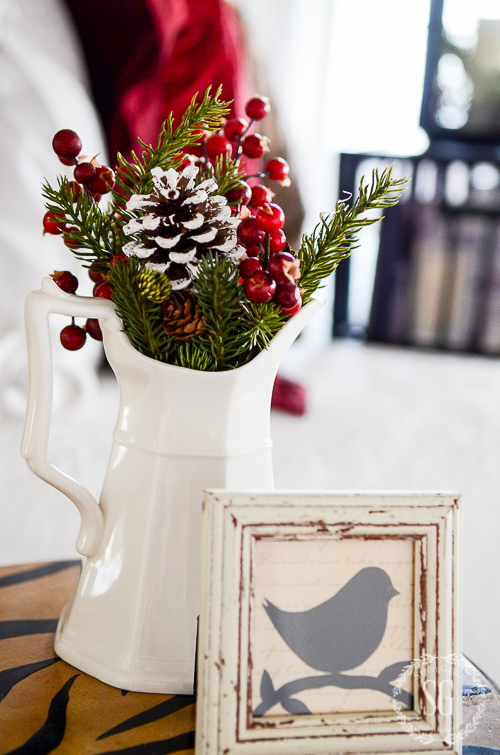 I bet your winter decorated home will be amazing! Sending love and prayers to you for restored health! Beautiful! What a lucky family! Everything says, home, family, welcome, Christmas togetherness! Your hard work will be greatly appreciated I am sure. Enjoy every minute. So lovely and inviting. 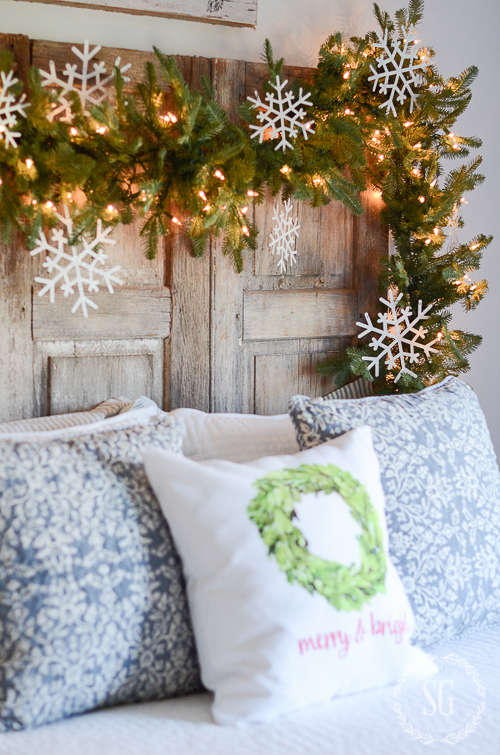 I love the pops of color in the first room and the whimsy of the snowflakes in the 2nd. 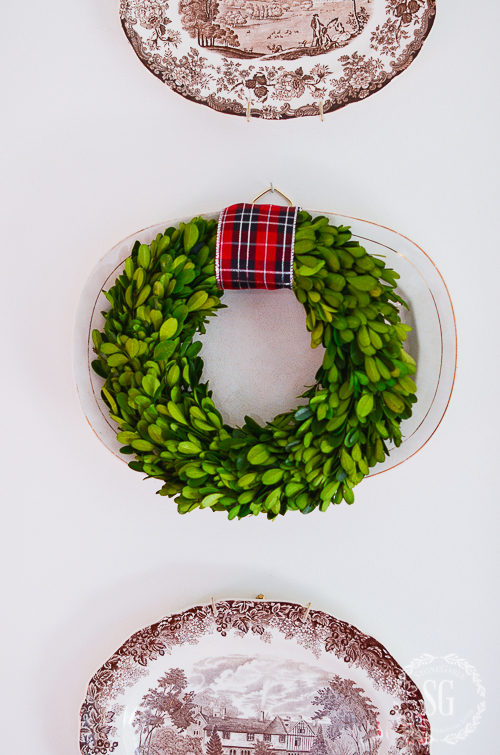 There are so many good ideas in these rooms but my favorite is the boxwood wreath on the plate. Simple yet stunning. Thanks for the inspiration! Beautiful guest rooms Yvonne!!! Looking forward to the candle lit tour. I’m especially fond of your son’s room and would feel so comfy staying there! WOWOWOWOOWOW!!! That’s all I can say. I want to be your guest for a week and learn how you put it all together. Your blog is like having my own design mentor. Love Love Love it! Merry Christmas Yvonne! Amy one of my main goals for StoneGable is to inspire women to love their home! I’m thrilled you are using StoneGable to inspire you! I am just stunned at how beautiful these rooms are! You are such a great decorator, and mama! All of our bedrooms will be filled with returning children too, but the most “decor” I do for them in their rooms is clean sheets. I better not let them see this post or they will revolt! Much love to you and your beautiful family as you celebrate the birthday of our King. Clean sheet are certainly an act of love!!! Your guest rooms are absolutely stunning! They are so welcoming and comfortable looking. I love that you make them so special for your children and their spouses. I wish you and your family a very Merry Christmas! I think it was sweet and thoughtful that you decorated the guest room with your daughter in law in mind. It must make her feel included and special. The whole house is just lovely! We’d like to be adopted into your family! Talent and a lot of hard work make it look effortlessly beautiful. Merry Christmas. Can I come for a visit? I don’t think I’d ever want to leave! What a wonderful way to welcome your family! Oh yes, Susan! Please come. How about the spring? Love the poster bed. I do the same with mine. It really adds to the Christmas spirit.. I would want to stay with you for weeks. Ha ha. OH MY WORD!!!!! 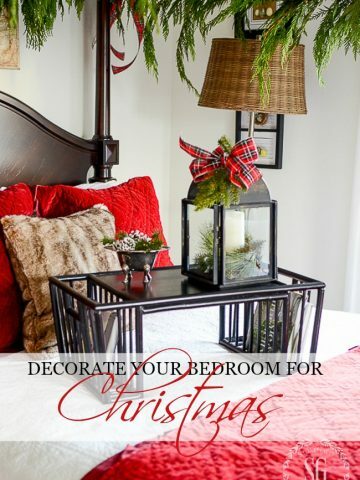 Now after I pick my jaw up off the floor let me say how I was oohing and ahhhing over the first room with the beautiful garland on the bed and the gorgeous velvet bedding in red and thinking it could not get any better it goes to the next room with that fabulous headboard in its Christmas finest!! 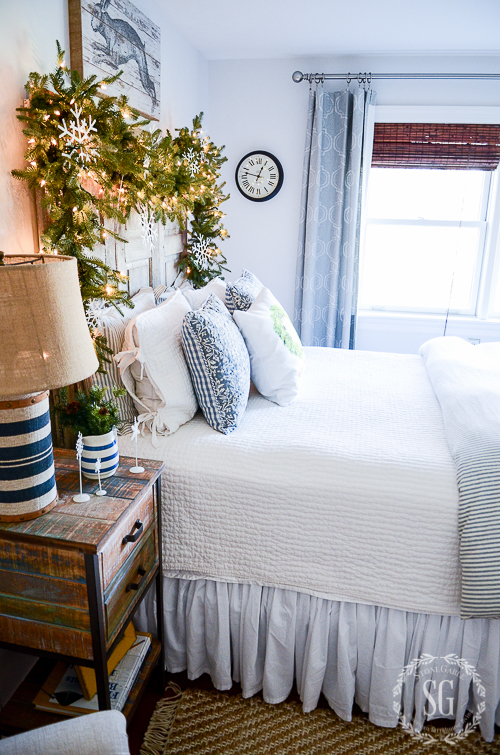 You have seriously made these rooms so festive for your guests! They may never leave!!! Yvonne I have been completely overjoyed at your decorating this season. You have truly outdone yourself! Both of the room are fit for a king and queen. I would love to know the details of the bedding in Christopher’s room. Specifically, where did you find the cream quilt and blue batik shams? Hi Laura, So nice to see you at StoneGable. 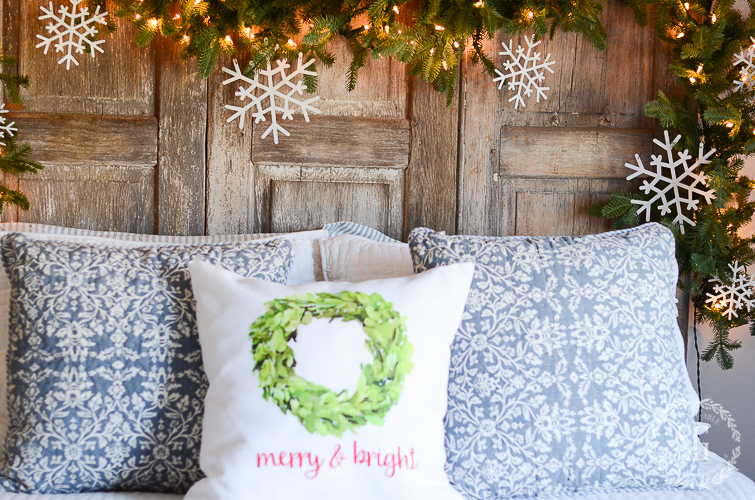 The pillows you are talking about are from Heritage Lace online. Merry and Blessed Christmas to you!!! Yvonne! It’s a beautiful, winter wonderland. Oh my goodness, if I were your guest, you’d have to push me out to get me to want to leave! Happy Hanukkah and Merry Christmas! Happy Hanukkah and Merry Christmas to you too! Yvonne, both of your guest rooms and so gorgeously decorated! I am amazed at how beautiful they are! Your guests are going to be so blessed to stay in either one of these wonderful rooms! I am so happy that you have the guest rooms ready!….Knock, knock, that’s me!! 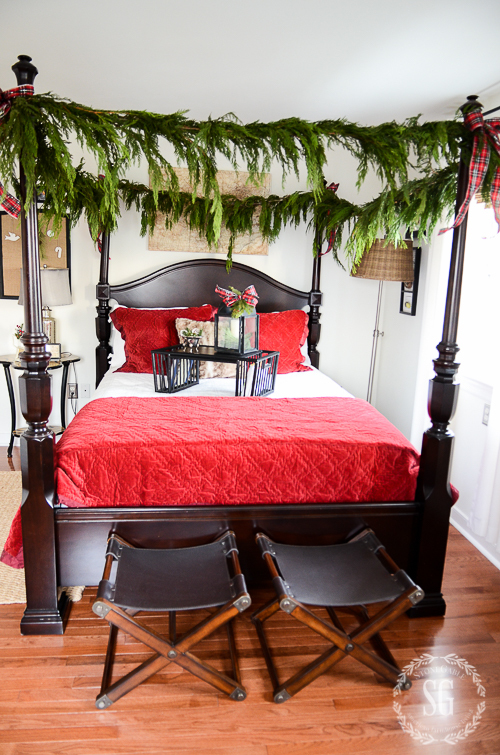 !…..Oh how I loved how you draped the garland on that gorgeous 4 poster bed…and the garland on that gorgeous headboard in the other guest room is amazing….Such beautiful touches everywhere…so I must say that be prepared to have guests stay well into the New Year as I would not leave either!! 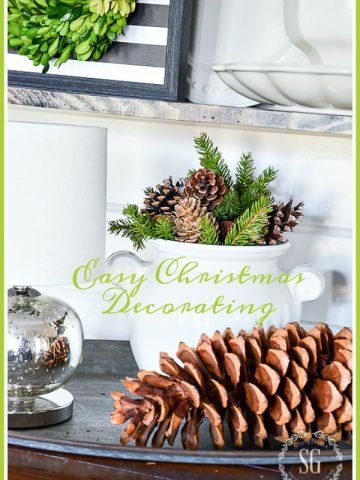 !….I am sure that Jackie and Christopher along with their wonderful spouses will be enjoying their rooms as your family gathers together for the Holidays…I loved every inch, nook and cranny of the rooms Yvonne….MERRY CHRISTMAS! I’d love to come stay in the blue & white room for a week or two! Both rooms are gorgeous, but the blue and white looks so soothing and relaxing. 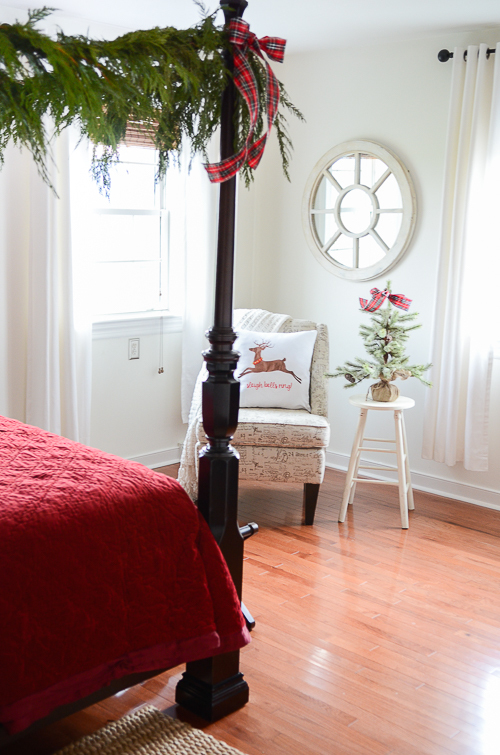 I love the deer pillow in the red & white room! Lovely guest rooms! How special each child and their spouse must feel as you have added such wonderful touches to each room. I would never want to leave! Yvonne, I love everything about the rooms, Santa will drop me off on Christmas Eve!! Love your Christmas tour. Your house is beautifully decorated and inspiring. Did I miss the star garland instruction post? No, I’ll post that next week. This week got a little booked up.